Prototype: German State Railroad Company (DRG) class 17.0. Former Prussian class S 10. Model: The locomotive has an mfx digital decoder and a sound generator. It also h as controlled propulsion. The locomotive has a powerful motor with a bell-shaped armature and a flywheel, in the boiler. 3 axles powered. Traction tires. The dual headlights change over with the direction of travel, will work in conventional operation, and can be controlled digitally. The engineer's cab has interior details. There is a permanent coupling between the locomotive and tender. The locomotive has many separately applied details. Length over the buffers 24.0 cm / 9-7/16. The Hapag-Lloyd passenger car set goes well with the DRG class 17.0 and can be found under item no. 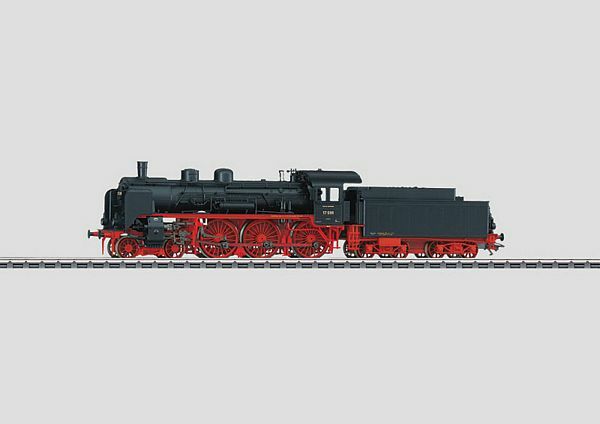 42229 in the Marklin H0 assortment.